Europe receives 80% of its natural gas supplies from Russia, through the Ukraine, as noted in DEL post "Holding the Russian Energy Bear at Bay". Germany is currently very dependent on Russian shipments of natural gas via the Ukraine. No wonder that former Chancellor Gerhard Schroeder played up his relationship with Russia's Vladimir Putin and played down Putin's anti-democratic ways. The icing on the cake was "Schroeder's 'Sellout''" in taking a lucrative job at Russian-owned Gazprom after he was defeated narrowly by Ms. Angela Merkel. All the more pleasing was the Sunday Times Online header "Merkel's harder line on Russia looks set to persist". "ANGELA MERKEL, the German Chancellor, showed no sign yesterday of being held captive by the deepening energy relationship between Moscow and Western Europe. While President Bush was urging a softly, softly approach to human rights criticism of President Putin, Frau Merkel was more forthright about the need for a free press. This G8 summit, it is becoming clear, will take a sharper tone towards the Russians. In the past, EU participants — and above all Germany — gave Russia an easy ride in recognition of the West’s overwhelming dependence on Soviet oil and gas. Frau Merkel, a fluent Russian speaker, who lived her first 35 years in communist Germany, has a far more hard-nosed attitude to the Kremlin. Why should energy supplies be allowed to be the defining element of the German-Russian relationship, she recently asked an adviser." Democratic values and personal freedoms are worth defending for this current German Chancellor. This type of refreshing focus for a critical player in the European Union goes a long way to explain why the massive rift in US-German relations has healed so quickly. The US-German position over Iran, Israel and Russia are converging to a large degree. Trade discussions are emerging with respect to the current failing Doha round of trade talks that should work against some of the French reluctance to see farm subsidies tackled. 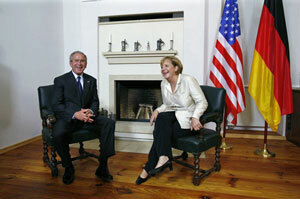 Ms. Merkel took Russia and China to task for their lack of "responsibility" in dealing with rogue nations like Iran. "We found that there is a lot that we [the United States and Germany] agree on, as regards our common responsibilities, responsibilities that we see for the two of us the world over. And I, for one, think that as regards, for example, Iran, this responsibility ought to be shouldered by more and more countries -- that goes for Russia, that goes for China. It will only be if we act in concert that we will be able to vanquish the tyrants, remove dictatorships and contain those who sponsor terrorism. And Germany would like to give its contribution to that." Germany, along with the United Kingdom, was successful, from their view, in getting the United States to agree to direct multi-party talks with Iran, something that has not been done since the 1979 Tehran hostage crisis. Both President George Bush and Chancellor Merkel suggested that it was best to keep their democratic criticisms to Mr. Putin private, that public condemnation would not best achieve the democratic reforms they are seeking in Russia. The upcoming G-8 summit in St. Petersburg that President Putin is hosting will be fascinating diplomacy to follow between the major powers in attendance. Pretty much nothing notable happening. My mind is like a complete blank. I've just been hanging out waiting for something to happen. Not much on my mind to speak of. I just don't have anything to say. That's how it is. I've just been staying at home waiting for something to happen. I just don't have much to say right now, but so it goes. I've basically been doing nothing to speak of, but shrug. Today was a loss. I don't care. That's how it is. I just don't have much to say right now, but I guess it doesn't bother me. Basically nothing seems worth thinking about. Nothing notable happening these days. Shrug. Not that it matters. My mind is like a void. I've basically been doing nothing , not that it matters. More or less nothing going on. I guess it doesn't bother me. Not much on my mind. It's sad to see how much respect the U.S has lost in the last few years. hombres admiraban las altas e inmoviles llamas. In my opinion the whole Europe depends on Russian gas supplies. That`s why we had this conflicts years ago. In my opinion the whole Europe depends on Russian gas supplies. Gas is a natural resource. Russia has lot of gas. The European import gas from Russia. Germany relies on Russia for natural gas. im McGraw special to execute very very very competitive wearing, such as football, even though he did not know his normal dad was an knowledgeable personal.